Welcome, fellow beer geeks! I've decided to create this blog to advance the good taste of beer drinkers everywhere. Headquartered in the Circle City, we will strive to educate the masses on what good beer really is. 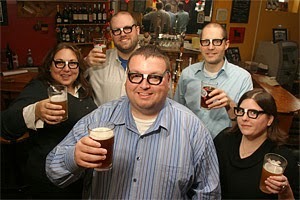 On August 8, 2006, these words were posted on a new beer blog called Hoosier Beer Geek. They were the first words ever posted on the blog. And they were the words of Chris Maples, a beer lover in search of better beer. A beer lover who wanted to write about what he drank. 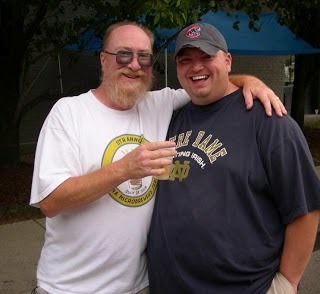 And above all, a beer lover who wanted to share his love of good beer with others. Chris began Hoosier Beer Geek as his personal beer journal. But being an amiable guy, Chris soon attracted a partner in beer drinking--a whip-smart fellow named Jason Larrison--who suggested that Chris host a weekly "Beer Roundtable" during which he and Jason would invite other beer lovers to choose a beer to drink and review. Of course, Chris was game, and he soon decided to dub roundtable attendees the "Knights of the Beer Roundtable," or the "KOTBR" for short. The first gathering of the KOTBR was convened a mere five days later with Chris, Jason, and Chris's wife Colleen holding court to review Dark Horse Brewing Company's Sapient Trip Ale. While Chris and Jason eloquently described the virtues of this beer, Colleen opined that it "tastes like chicken." This unfortunately earned her a lifetime ban from the KOTBR, so a new member of the KOTBR was needed. As luck would have it, I was that new member, joining Chris and Jason to review Spaten Optimator at the Rathskeller a few weeks later. Then came the third roundtable at MacNiven's, where Chris and I reviewed Three Floyds Robert the Bruce. In our naiveté, we were not all that impressed with the beer (our opinions later changed of course). But the important thing to arise out of this roundtable was that Chris instituted the KOTBR's practice of giving a "mug rating" to each beer we reviewed, with (in Chris's words) "5 mugs being simply an amazingly fantastic beer, and 1 mug being Coors Lite." The KOTBR in the early days. Only three months after the blog started, HBG was featured in Indianapolis Monthly as a blog that deserved attention. Soon thereafter, we established our home base in Fountain Square at Deano's Vino. By 2007, three new KOTBR--Kelly Jordan, Mike Atwood, and Gina Rakers--had joined the crew. And the blog grew as we tried to spread the word about Indiana beer in the small but growing craft beer scene. We were having loads of fun doing so. But by 2008, Chris's professional and family life were really blossoming and were taking up a lot of his time. So he decided to hand over the reins to the rest of us and bow out of active participation in the KOTBR. We were of course saddened not to have him regularly at roundtables, but we still got to see him occasionally at beer events. He even joined us every once in a while at roundtables. But still, we missed his warmth and wit. And we missed how much of a pushover he was for craft beer. We used to kid him about the number of 5-mug ratings he gave out when the rest of us were not quite as generous with our mug scores. Then, three-and-a-half months ago, Chris learned that he had an aggressive form of cancer and would need to undergo three courses of chemotherapy. While the cancer was at an advanced stage, the prognosis was decent. As Chris progressed through his treatment and kept his chin up, we were sure that the cancer would go into remission. But on Sunday, Chris lost his battle with the disease. He was only 37 years old. To say that we are saddened doesn't quite fit here. We are devastated, and not just because of how young Chris was, or how quickly the cancer took him from this world. We're devastated because of who Chris was. Chris was warm. He was kind. He had a wonderful sense of humor. He was a devoted dad and husband. And he had such heart and caring for others, especially those to whom life had not been kind. These traits are undoubtedly what led him to work in the non-profit sector for most of his professional life. This may not be an apt analogy for some, but when I think of Chris's contribution to craft beer in Indiana, I think of a band like the Velvet Underground--a band that not many people knew about when they were together but who became influential over time. I'm guessing that few folks in the craft beer scene now would know who Chris Maples was if you mentioned his name. But while Hoosier Beer Geek wasn't the first Indiana beer blog, Chris created it at a time when better beer was beginning its upward trajectory in this state, at a time when better beer needed a passionate and witty cheerleader. Chris was that cheerleader. When Chris gathered with us at roundtables, he used to look us all in the eye and proclaim, "I love you, man." For many people, this would be a mere platitude. But Chris always meant it when he said it. Chris, we love you too. And we miss you greatly. May your memory be for a blessing. You only get a few friends in life that wouldn't get mad if you threw up in their car. Chris had a magnetic personality and you couldn’t help but like him. The first time I met him, it felt like old friends. From then on, I knew that if our plans included Chris, it was going to be a good time. I have so many great memories of sharing beers and conversation with Chris and I feel lucky to have known him. We shared countless beers at Deano’s, HBG Roundtables and parties, beer festivals, and events. I’ll think of him whenever I have a Spaten Optimator or hear “Come on, Eileen” and I will smile, knowing he would be doing the same. Actually he wouldn’t just be smiling, he’d probably be proclaiming to all, a favorite slogan of “I love you, man!”. Chris wasn’t just a hell of a person to party with. I’ll always admire him for pursuing his work endeavors with great fire and positive attitude. Even when he was faced with obstacles (like a fire before a fundraising event, for example), he always found a way to have fun. When he put his mind to something, he did so with focus and determination. For his family, his work, or his friends, he was as passionate as he was caring and he will always be remembered. I give him 5 Mugs. I could tell a lot of stories about Chris. A lot of them involve beer. My favorite occurred in July 2006. My wife Dani and I had just had our son Jacob. He spent the first couple of months in the neonatal intensive care unit (NICU) because of a heart issue and subsequent brain bleed. As you can imagine, it was a challenging time for my wife and I. I came home one day to find a six pack of Thirsty Dog Old Leghumper, a beer I had never had before. There was a note from Chris offering to take me out for more beers or whatever was needed to help out. I had known Chris for about eight years but I couldn't say that I knew him well at that time. That simple gesture opened the door to what would be a long friendship. Our friendship grew rapidly from there. We had a lot in common. We were both married to intelligent, strong women. We were both new dads. 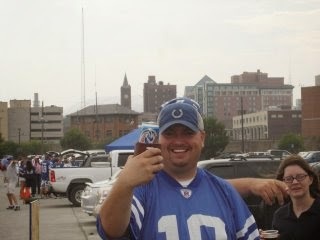 We both loved the Colts, food, and politics. The Old Leghumper opened my world up to a wider variety of beers. He had a blog that was his personal beer journal. He called it Hoosier Beer Geek. Chris was a passionate man. He was passionate about his wife Colleen and his sons Jackson and Luke. He was passionate about people and about life. His departure leaves a great void in this world. I have to say this post brought tears to my eyes. I knew Chris. And everything that you've said above is absolutely, 100% true. He was definitely one of the most stand up guys on the planet. And also an amazing father and husband. There are no words to even describe how much of a loss his loss will make overall. May his memory be blessing. I'm so sorry for your loss. Thank you for the tribute and for sharing with us the kind of guy Chris was. We will raise a glass to him tonight. Jim, Gina and Jason, thank you so much for writing these words about Chris. Well done, my friends.